I fancied a very long bicycle ride. I wanted to repeat the ride I did a couple of years ago. 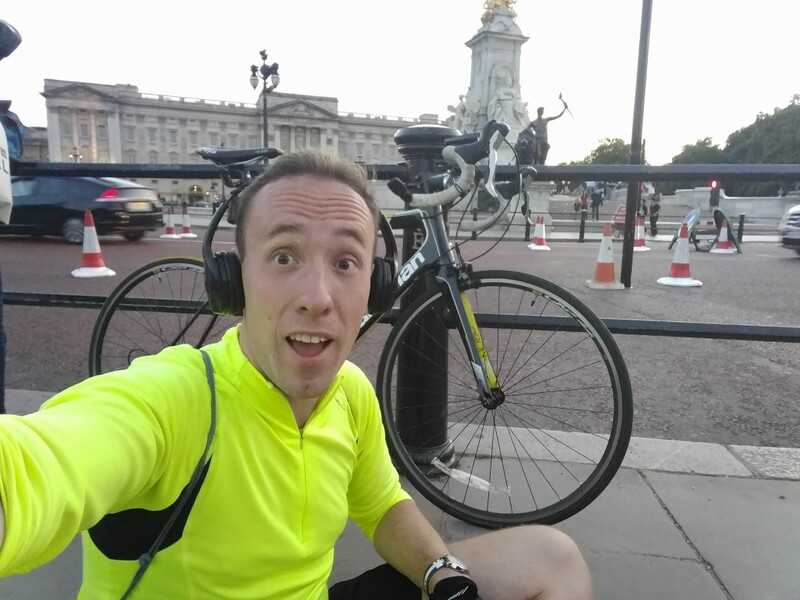 I loved the feeling of setting off cycling from my house and during the same trip, cycling along Whitehall. On Tuesday 15th August 2017, I awoke a little late – it was around 11.30am. I expected, owing to the time I went to bed the night before, I would be umming and ahhing about whether to go. The morning had been lost but there was still the afternoon and a glorious one it was. I just felt like it. I got my bits together and sorted. 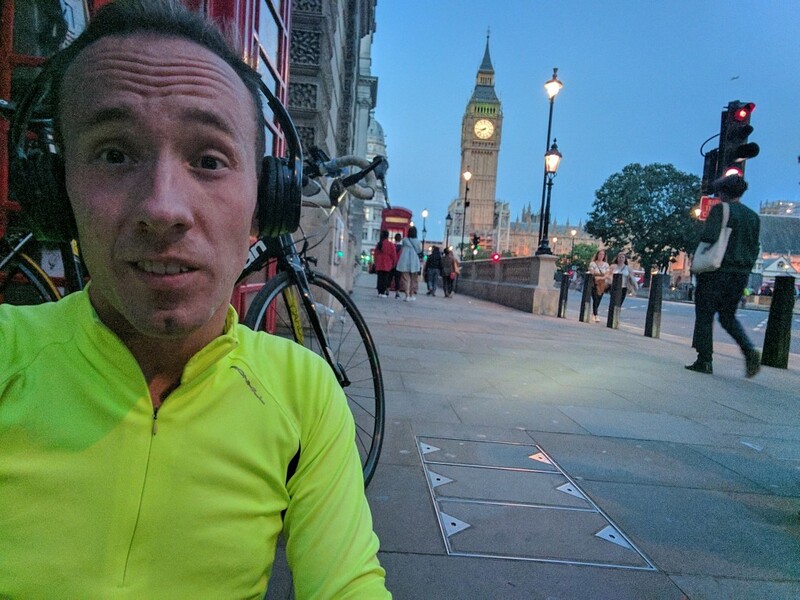 The night before I made sure my Garmin, front and back Cycliq camera and light combination, as well as a spare light set were all charged. After a wholesome breakfast, I pumped my tyres, but then sat down at my computer. I opened up the Garmin web page and decided to plan a route or “course” as they call it. For the numerous longer distance cycle rides in the past, I have used Google Maps navigation. I have had playing in my ears the glorious Google SatNav voice giving me directions such as “at the roundabout, take the second exit”. Despite the turn-by-turn voice navigation being very good and handy, especially when there was a diversion as it would simply re-calculate, when it did come to faster, less cycle friendly roads, it was bound to lead me on them. It is easily possible to state that the route needs to avoid motorways, and I have never been led on one. But it does sometimes lead me on to dual carriageways. 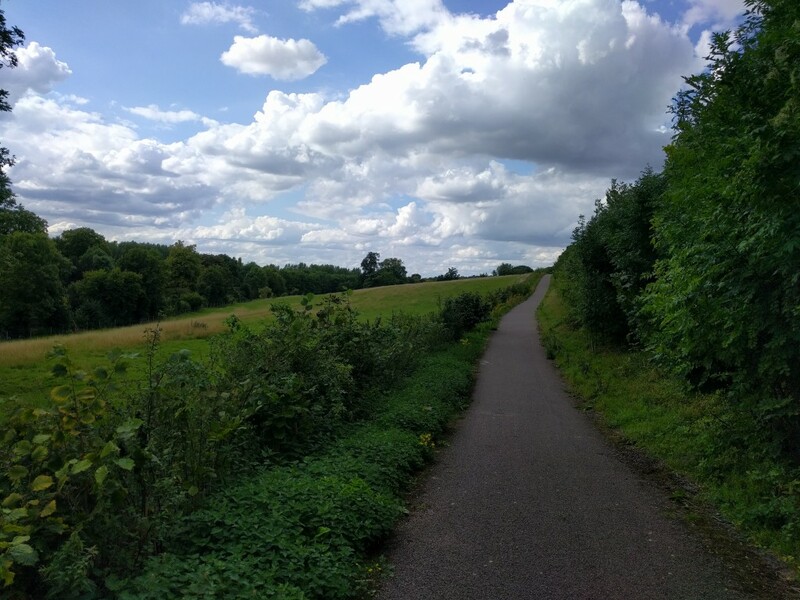 I have to pretend I am a car because if I were to say I was a bicycle, it would inevitably take me on the National Cycle Network. Although this is good in places, it often goes through forests and on patchy, gravel surfaces which are just not suitable for 120lb of air pressure in narrow road tyres. Google’s idea is that they want to get you to your destination as quickly and efficiently as possible which isn’t exactly what I need. So this time, I decided to plan a “course” on my Garmin. I stated my home as the start location and drew on my route. I zoomed in enough to see vaguely what type of road it was and my rule of thumb was that if the route is a bit bendy it is most probably a quieter country road. The use of the Garmin generally worked fantastically well. On my stem is located the the Garmin which showed me as a triangle on a long black line. My objective was to follow the line. It gave me the rough idea of the shape of the road ahead of me. At roundabouts, especially ones with numerous exits that were close by, sometimes I took the wrong one. As I was in a bit of a rush to leave the house, I didn’t spend a lot of time drawing my route and this led to me accidentally sending myself through a park and leading myself on some dodgy, fast roundabouts sometimes. Another small issue was that towards London with the many one-way streets, it got confused and tried to send me the wrong way down a road or two. 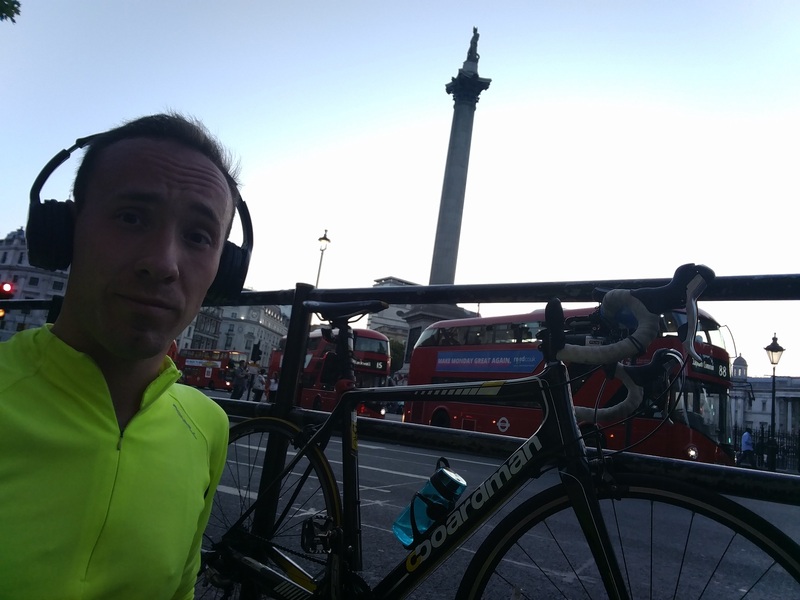 There few hiccups, which did result in time-taken being significantly more as I went back on myself to re-join the route. The ride itself was lovely. It was a nice, warm day and I saw some lovely sights. The benefit of the plotting of my route on Garmin was that I was able to pick quite a random array of roads. I saw some magnificent houses, quaint villages and fields and fields of green and some wheat. I expected to see Theresa May. There were an awfully high number of pot holes but dodging these, the roads were smooth enough, especially towards central London. They must have a special pot of money to resurface their roads. Most motorists were really considerate and they remembered that my vehicle and body mass is less than 100kg where as they are nearer the 2,000kg mark. A couple of drivers went way too close and it was almost as it I weren’t a person. Maybe they’d be so dangerous and inconsiderate and do the same if they were passing their mother or daughter, father or son. Likely. 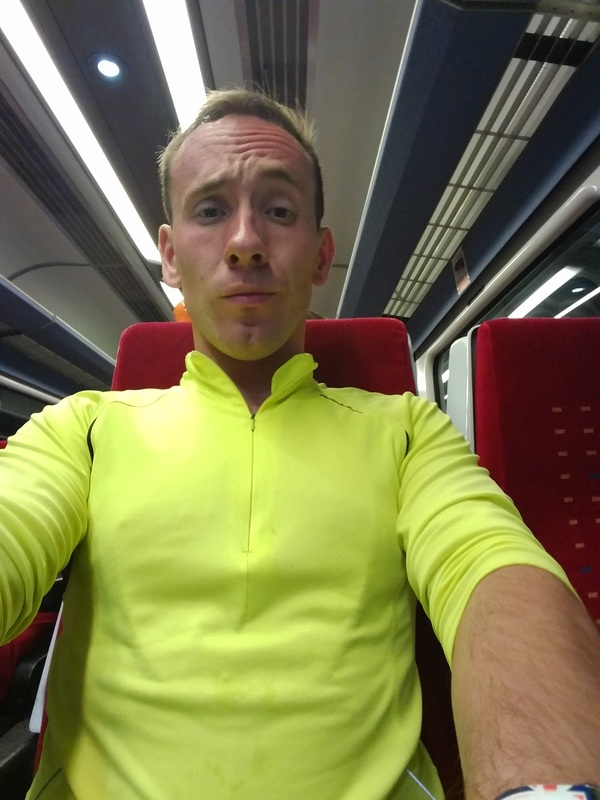 I just had cycled through Luton and was about 2.5 miles south when suddenly I felt and heard air leaving my rear inner tube. Nooooooo. I pulled up where it was safe to do so and dismounted. Nowadays I rarely carry equipment to change my tyre. The puncture repair kit and the pump adds weight and the likelihood of actually getting a puncture is low. I did though. On Google Maps, I typed “bike shop”. There was a Halfords only 2 miles away. I began the painfully slow walk along a shared pathway to the shop. I remembered passing the same retail park only a short while before. Anyway, once that was fitted I was back on my way. It added about an hour to my trip. It certainly wasn’t devastating. It was an adventure. Imagine if it happened in the middle of nowhere. Here’s a photo of my walk to Halfords. I would totally ignore the stats, other than the distance. I often forgot to pause my Garmin whenever I dismounted my bicycle and walked it back to the course when I accidentally left it. Time racked up. 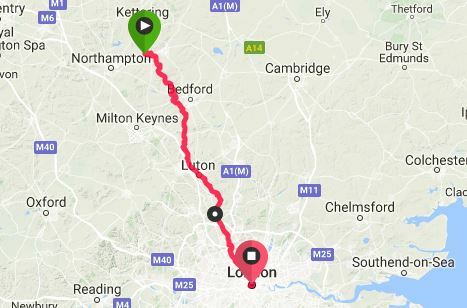 So my trip from Wellingborough to London was 79.34 miles which I did in 5 hours and 50 minutes with an average speed of 13.6 mph. 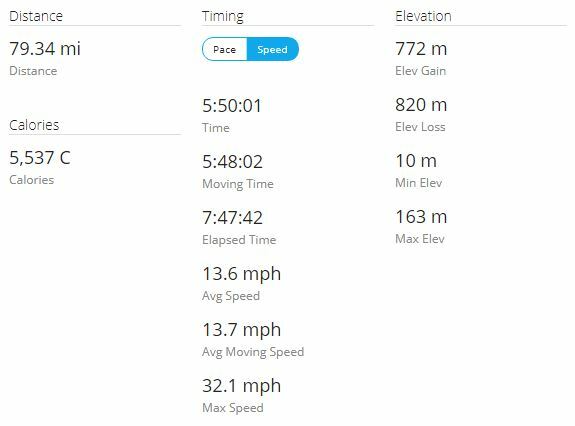 My maximum speed was 32.1 mph and I burnt 5,537 calories. And here’s one of the train back home. I am not sure why I was pulling that face.